After roughly a year of hard work, we’re happy to announce the next major iteration of Komodo IDE. There are so many changes in this release it’s hard to list them all. I would encourage everyone to check out our What’s New page and Download the 21-day full featured trial to get a sense for things. That said, I’d like to give a short overview of some of my favourite changes in this iteration of Komodo IDE. 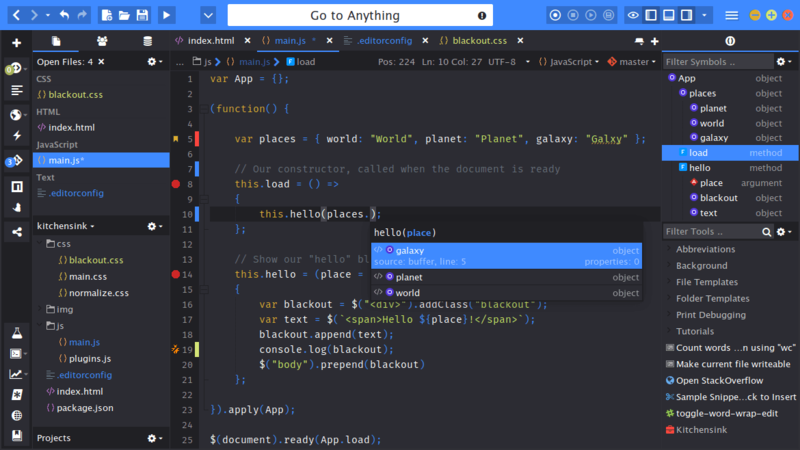 To celebrate the new release, Komodo IDE is on sale now! Get $50 off new licenses and upgrades, but act quick – the offer is only until Oct. 31st. No doubt the biggest feature in this release is our revamped Code Intelligence, featuring an all new backend, frontend and database to make it more robust and faster than ever before. And the performance gains don’t stop with just our CodeIntel component. Our old CodeIntel tended to bog down the entire IDE at certain points. Thanks to our revamp, these types of slowdowns are completely gone. Komodo 11 is snappier than ever, and friendlier with memory consumption to boot. Here are some of the changes in our new CodeIntel. If you’ve used CodeIntel before, you have no doubt noticed that completion triggering could feel a bit random. This was because each language used to decide itself at what position of a typed word completions could trigger. The new CodeIntel can now trigger at any position (with certain exceptions, such as whitespace), regardless of which language you are using. In addition, the completions that appear now convey a lot more information, such as the source of the completion. Previously called the “section list”, our new symbol list shows all symbols in the current file. By default, it only shows symbols that contain other symbols, so you’re not navigating through a huge list of symbols unless that’s what you want. The long-standing bug of the section list automatically closing if a search query was not found is thankfully not present in the new implementation. Believe it or not, it really did take a rewrite to fix that (it was one of THOSE bugs). Our new symbol browser focuses exclusively on your current file, allowing you to quickly navigate your relevant symbols while you are coding. Whereas our old implementation tended to throw way too much at you to be useful, the new implementation focuses on what matters. You can still access symbols in other files via “Go to Anything”, or just by jumping to definition. Our decision to revamp Code Intelligence was based on two big goals. We wanted CodeIntel to be more robust, faster and just a pleasure to work with. But just as important, we wanted a solid foundation for us to evolve on. Our old CodeIntel was nearly a decade old and was starting to show its age, but with this new foundational update, we are in a much better position to iterate and add all sorts of new features that would have been difficult to add before. In a sense, the new CodeIntel and Komodo 11 are a gift that keep on giving, as it enables us to develop new features that you’ll soon be seeing in Komodo updates. One thing we’ve noticed time and time again is that despite how useful a full-on debugger can be, many people still prefer simple “print debugging” for most of their development, and will only resort to a real debugger when they are truly stuck with something. This is a very new concept that I don’t recall having seen in any other editors, and as such we developed it to be as simple and straight-forward as possible, with the intention to iterate on this in the future based on user feedback. If you haven’t heard of devdocs.io, you should really check it out. It’s an amazing open-source tool that parses documentation sites for your favourite languages and frameworks and provides a single unified interface to interact with them. It allows you to select which languages you want to see documentation for, and also has a very useful offline feature. Komodo 11 provides integration with this amazing tool, letting you simply select some text and invoke a devdocs.io search for it. This is fully integrated within Komodo, so it opens in a Komodo window, not your browser. Our new live previewing feature is all about giving you immediate feedback to your changes. Currently usable on HTML and Markdown files, this feature allows you to edit your markup and instantly see your changes in the preview alongside the editor. This replaces our old Markdown Preview feature, but complements our “Browser Preview” feature, which is used to open a file in your browser or view it in the integrated Komodo Web Browser. Easily access your last 10 clipboard entries by pressing ctrl+shift+v. One of our developers, Carey Hoffman, has been wanting to get his hands on this feature for a while now. Technically this wasn’t even meant to be in version 11, but when we had a short internal hackathon he took his chance, and I’m glad he did. This is one of those features you don’t use constantly, but when you do you’re happy that it’s there! Project wizard, file and folder templates, dependency detector, enhanced publishing UX, automatic formatting, async remote files, UI enhancements, enhanced support for Laravel, WordPress and Drupal…oh boy, there’s just too many to describe. Check out our What’s New page to learn more. And remember, Komodo IDE is on sale now: Get $50 off new licenses and upgrades from now until Oct. 31st. Try out Komodo IDE 11 and let us know what your favorite new feature is in our community hub!